Michael Abeyta-Griego, 16, left, and Alex Foreman, 16, spread whipped cream on pumpkin pies as Hope Crespo, 16, and Taelor Cardenas, 16, right, chop asparagus and portobello mushrooms while preparing lunch June 30 at the soup kitchen. The students served 115 meals as their final project for Share Our Strength’s Operation Frontline. It's tough to teach teenagers about the perils of fatty foods, but when they create a Blubber Burger it puts nutrition in perspective. Durango students in a healthy-cooking program created the greasy visual aides, which were globs of Crisco scooped between hamburger buns. The hands-on exercise showed the exact amount of fat grams in a fast-food meal converted to teaspoons. The gross-out exercise was part of Share Our Strength's Operation Frontline program, a six-week course held in May and June for Upward Bound students from Fort Lewis College. 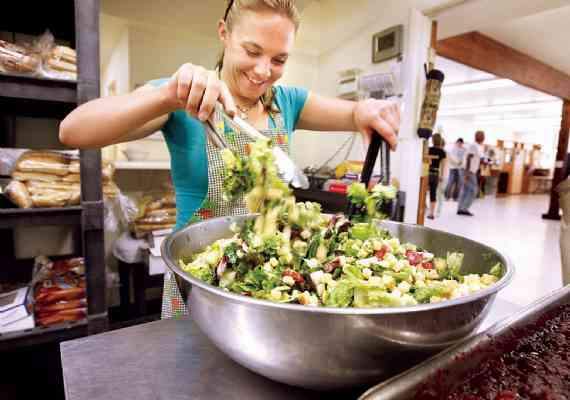 Share Our Strength is a national nonprofit with a mission to end hunger in the U.S. Durango's Operation Frontline is an SOS outreach program taught by volunteer chefs and dietitians to show limited-resource families how to prepare meals that are both healthful and affordable. Katy Pepinsky, Share Our Strength program coordinator, brought a lot of people together to make the Blubber Burgers happen. She partners with local agencies that are working with low-income families. "They wanted affordable classes for their clients, and this is a free program, so it was a great fit," said Pepinsky. Eight students participated in Pepinsky's 13th Operation Frontline class this year. Wendy Rice with CSU Extension taught the nutrition and food-safety portion of the class, and Warren Smith, Manna Soup Kitchen's new kitchen manager, taught basic cooking skills. The course included tending and harvesting food from vegetable gardens. Pepinsky said this was not part of the traditional curriculum, but it was included because of the local activity around school gardens and community gardens, including Manna's kitchen plot. The teens knew little about cooking before the program, so their final project was ambitious: Harvest, prep, cook and serve 115 hot lunches at Manna on June 30. The energy in the kitchen on that day was intense and focused. Smith, who supervised the lunch, was thrilled with the teens' performance, and said they served all the meals on time. "I was so blessed to teach them and be involved in the program. They're good kids," he said. Pepinsky praised Smith for his energy and rapport with teens. "He helped them feel less intimidated by explaining words like sauté, and taught them that cooking can be creative and fun," said Pepinsky. She said she's grateful to other dieticians, restaurants and personal chefs who have volunteered to teach other classes, including: Carver Brewing Co., Cyprus Café, East By Southwest, Zia Taqueria, Sky Ute Casino and Resort, Florida Mesa Elementary Kitchen Manager Daniel Lucero, and personal chefs Cathy Alfandre, Lauren Slaff and Julie Mackiewicz. Pepinsky said Manna's public meal was tailored to FLC's Upward Bound, because the kids were working on service learning. "They wanted to give back to the community. And they got the opportunity to do that," she said. The students used onions, spinach and radishes plucked from the garden for the day's menu, which included: honey glazed turkey, mashed potatoes and gravy, garden salad with sautéed asparagus and portobello mushrooms, red beans and rice, and pumpkin pie with whipped cream. "The goal was to learn about how to cook and serve food for a low-income family," said Maleeka Jihad, a leader with Upward Bound. 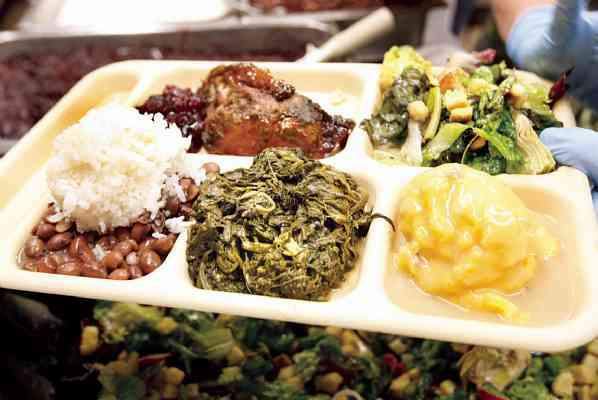 She said the students spent time learning basics, such as portion sizes and food groups. "I learned a lot myself, and it made me realize it's easier than I thought to eat healthy," said Jihad. Students Hope Crespo and Bree Hofmeister, who both live in Durango, said they had no previous experience in the kitchen. "It was all new to me," said Hofmeister. "I thought it was pretty fun." Pepinsky said she learned "so much" through each class series, and has changed her own meal-planning and shopping habits. She's pleased that she has seen "the lightbulbs go off" for people about healthy cooking, including the teens in the recent class. "They're going to be on their own soon, and these are important skills to take with them as they have their own families. Hopefully, they'll pass it on." Operation Frontline or would like more information, call Katy Pepinsky at 382-6469 or e-mail pepinskykp@co.laplata.co.us. Upcoming classes will include courses for adults, teens and parent-child cooking. One class will be taught in Spanish. For information, call Liza Coepp at The Family Center at 385-4747.